Qualified properties in Snohomish County and on Camano Island are eligible to receive funding (cost share) from the Snohomish Conservation District, which can help you pay for your rain garden. Contact our Community Conservation Team at ccteam@snohomishcd.org to learn more. There are many resources available to homeowners who want to build rain gardens on their own. Got a question about rain gardens? Contact our Community Conservation Team by clicking the button. This video provides an overview of the rain garden construction process from beginning to end. There currently are not any events planned. These two guides will help you take care of your rain garden after it has been installed. Download the first link for a more in-depth explanation of what your rain garden needs, and print out the second one to hang on your fridge to remind you at-a-glance! This regional initiative has many great resources to learn more about rain gardens and where to find professional help if you live anywhere in the Puget Sound. 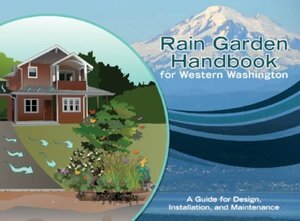 Produced jointly by the Washington State Department of Ecology and WSU Extension, this handbook includes all the information you will need to plan and build your own rain garden.